It is Tuesday night, and I am sitting in a historic hotel, just a kilometer or so north of the Scotland/England border. It seemed a fitting way to end our time here in Scotland. We are at the very farthest south in Scotland that we will travel, when just a week ago we were at Dunnet Head, the northern most part of the mainland Scotland. The entire week seems to be dominated by the two “bookends” as it were. 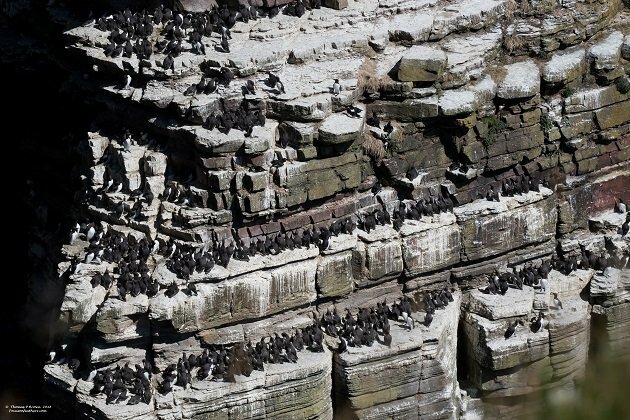 At Duncansby Head, just a few miles south of Dunnet Head, I got to see birds nesting, and gathering along the steep cliffs, in numbers that I can not even imagine. Today, we visited a Red Kite feeding site, and in a matter of minutes we had well over 100 Red Kites swooping in from all directions to get a pice of the food offered to them. Now, dont get me wrong, there have been some nice birds, and locations in between, but these two experiences are just so hard to put out of my mind. Duncansby Head, was in all honesty, an after thought, and were convinced to go see it by the owner of the RV park were staying in. At Dunnet Head, we got to see a couple of Atlantic Puffins, a few Razorbills, some Guillemots and gulls. We started the next morning with a walk along the tops of the cliffs that form Duncansby Head. 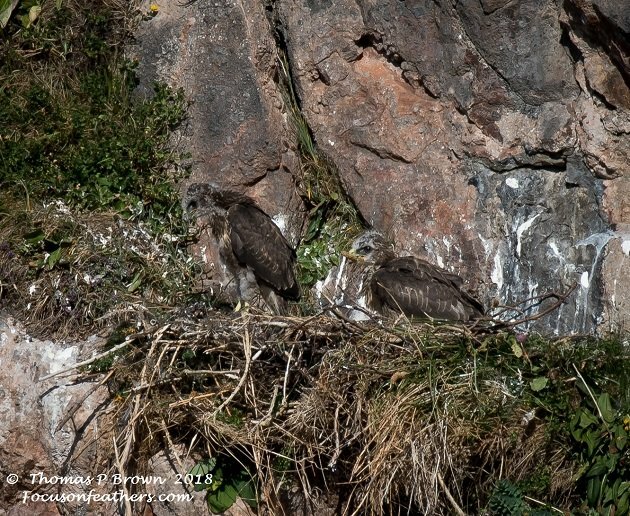 I was blown away, and knew I was only seeing a very small percentage of the birds there. We quickly drove to town to arrange a boat trip to see the cliffs from the water side. 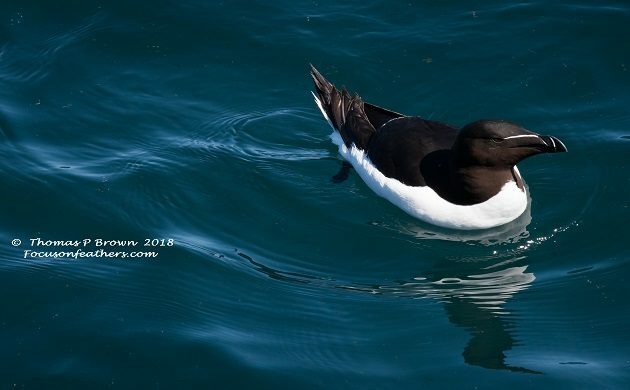 Hundreds of Black-headed Gulls, Greater Black-backed Gulls, Mew Gulls, and Fulmars, thousands of Razorbills, 60-70 Puffins, and literally tens of thousands of Guillemots. 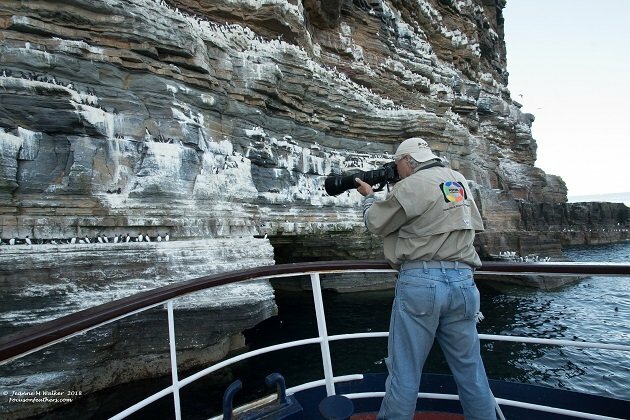 Here is just a small portion of one wall, covered by Guillemots. 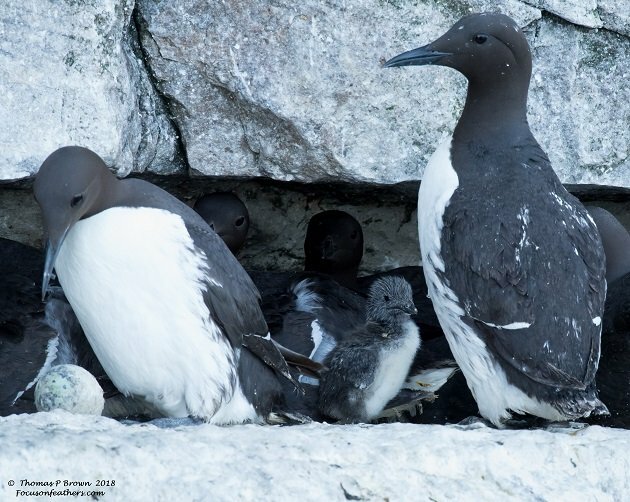 I found this little grouping of Guillemots, with parents, babies and even an egg. 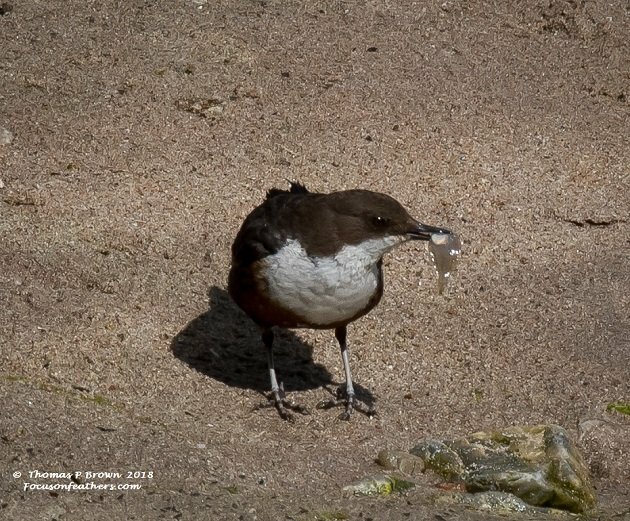 I caught this Guillemot on the way back with dinner. 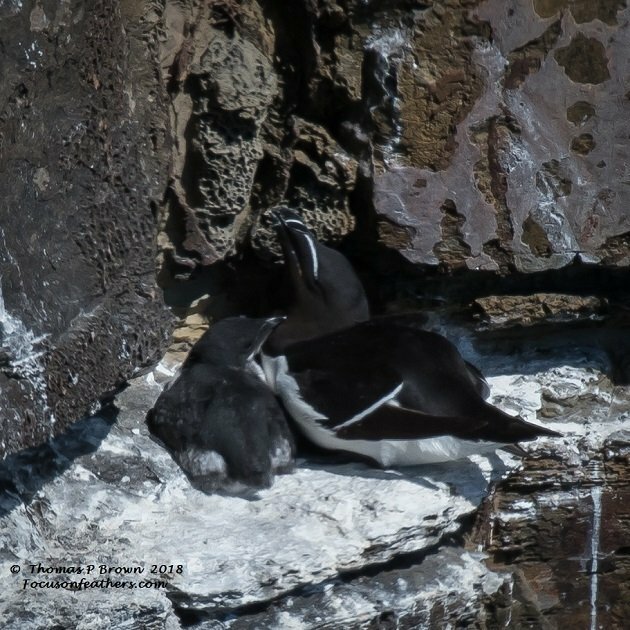 Being from an area that has never seen a Razorbill, I just can not tell you how excited I was to see thousands all in one area. 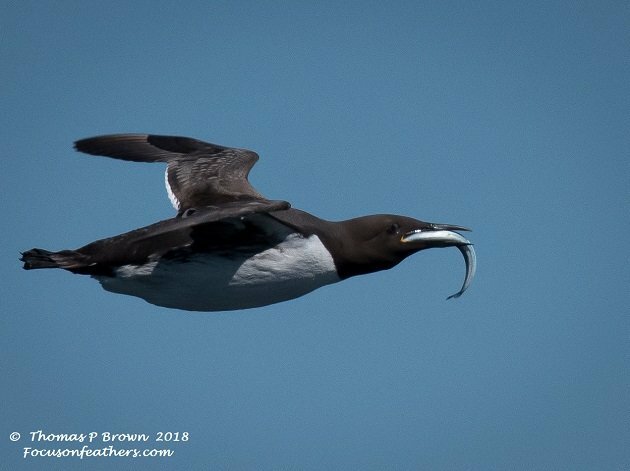 I had a lot more photos picked out, but did not want to bore you with my Razorbill photos. Mom and her baby. Dad had just flown off, I am sure to find a meal. 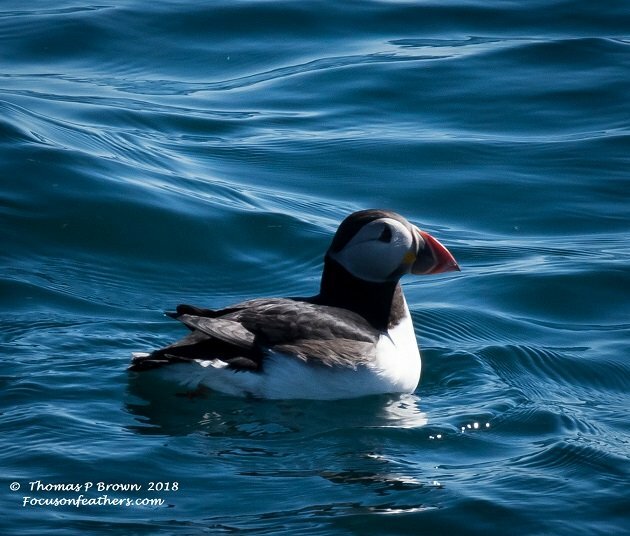 While there were way less Puffins than any of the other species, they are still so much fun to see. 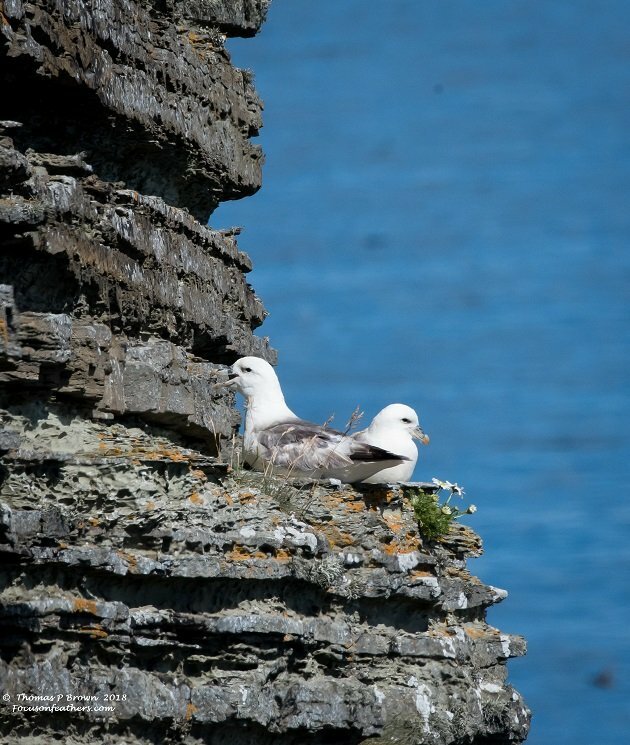 This pair of Fulmars had a real “room with a view”. They are nearly 200 straight up from the water. 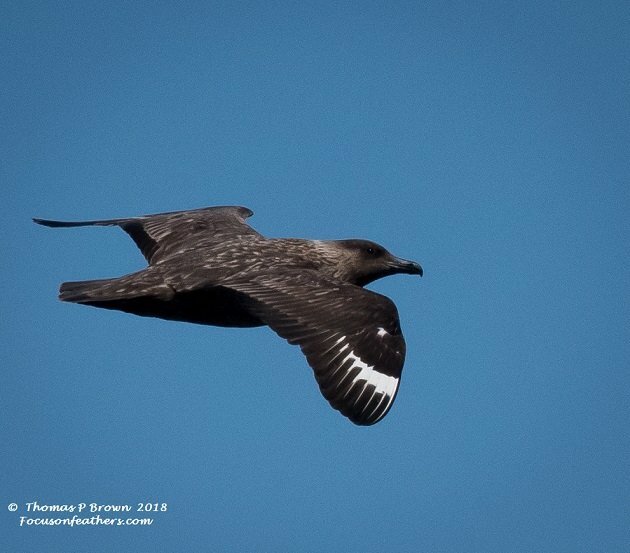 There was a good population of Great Skuas, circling, looking for a quick meal along the nest sites. I have to admit, some of this photography work is easier than others. The boat Captain got us right in close. Thanks to my lovely wife Jeanne for this picture. 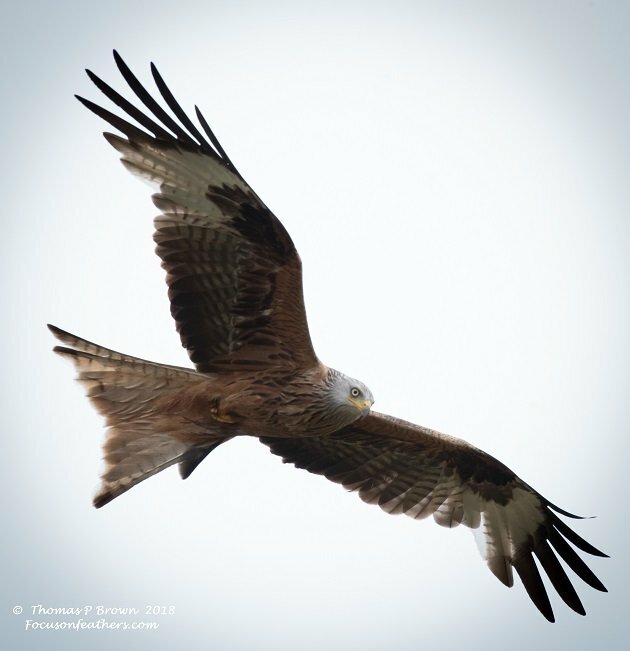 Red Kites were considerted a Threatened Species starting in the early ‘80s, and a nation wide program was started to re-introduce them around the UK. 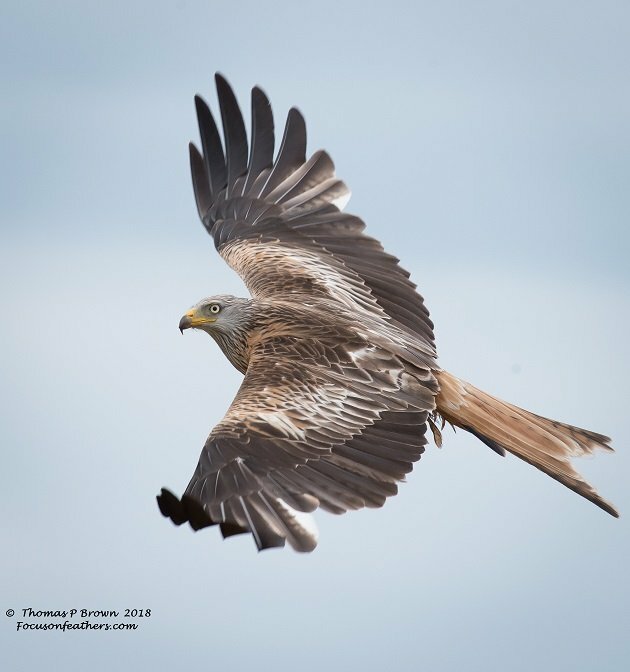 Re-introduction of the Red Kites in southern Scotland was started in 2003 with 40 birds released, for the most part in secret. The Bellymac Farm turned out to be the location that the birds choose to gather in. After the owners contacted the Royal Socieity for the Protection of Birds (RSPB), looking for an explanation as to where the heck all these birds came from, it was determined that the farm would be used as a feeding station. What started as a small group of birds, with the hope they would make it on their own, is now a very strong breeding population. Todays demonstration was certainly enough to convince me that the program was working. Here are a couple of the shots I was able to get today, despite some light showers and dark clouds. 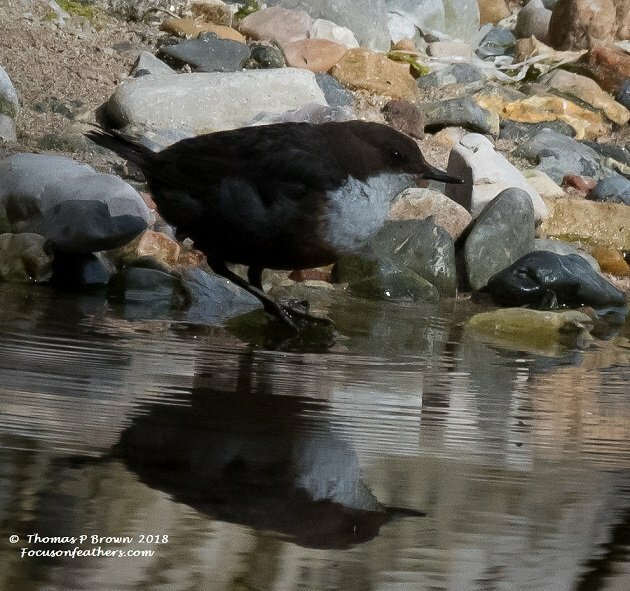 I have made it no secret that one of my all time favorite birds to photograph is the White-throated Dipper. When were visiting Smoo cave, this one was right in the cave entrance. I gave up on visiting the cave, and just watched this bird washing, preening and then jumping right in, and catch this small flat fish. One of our stops was at Dunrobin Castle, which just happened to have a falconry exhibition. The gentleman who put on the show was incredible, great showman, but very well studied on the birds, and very loyal to them. 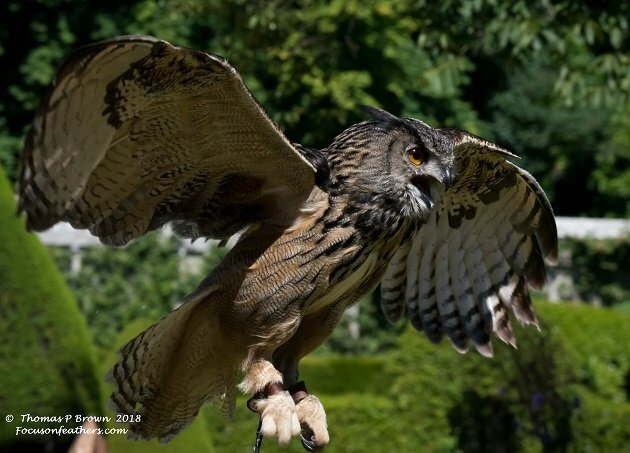 The show stopper was his Eagle-owl. He also had nearly twenty other species there to show, with Harris Hawks, Peregrine Flacons and a pair of Golden Eagles, just to name a few. We had made an over night stop at the Durness, with no real birding plans, just a nice stop on a cliff over looking a white sandy beach and the ocean. Every place we stop, I always visit with the locals to see if there is anything interesting bird-wise around. That was how I found out about the Buzzard nest with these two cuties waiting around for dinner. This picture is for our esteemed Beat Writer, Redgannet. 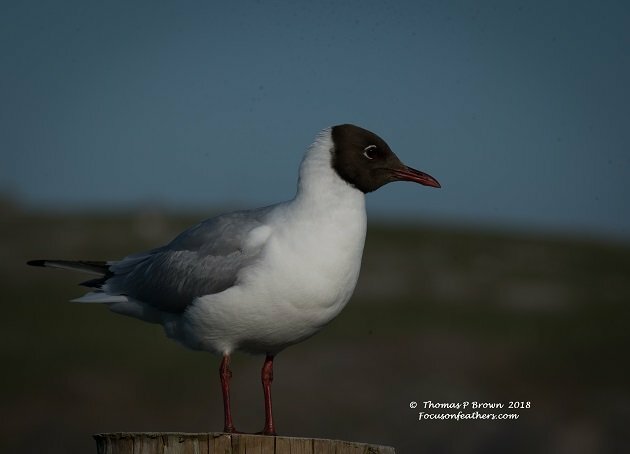 In support of his “Come@Me” story on bird names, I present for you the Black-headed Gull, with its brown head. Tomorrow morning we will head on down to England, and the township of Hull, to visit the Spurn Wildlife Reserve. Then a little zig-zagging around England, before heading back to the good ‘ol USA. Not only are you driving 3 continents, birding, blogging, editing photos, you are actually reading blogs too? 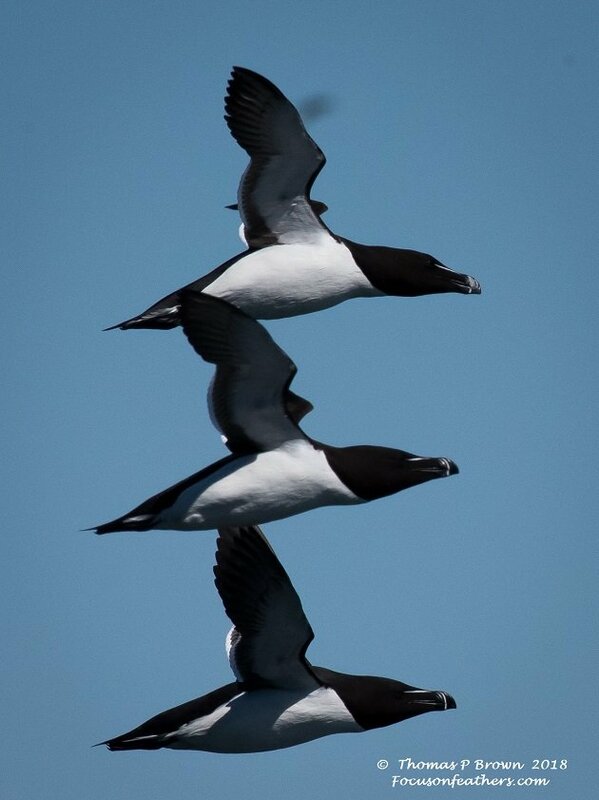 I love the Razorbill flypast! It’s easy, you just don’t sleep. As this part of the adventure comes to an end, I will admit, I am pretty tired, but what a ride it has been. Mum just walked to the end of Spurn and back last week and there is a lot to see at the Kilnsea Wetlands nearby too, so make sure you stop in there just before you get to Spurn! Thanks Clare, we are actually staying at the Spurn Observatory while here. They have a great hostel type place, reasonable prices and right in the middle of everything. In addition, it is a great way nto get some insider tips ( Like where to find the nesting pair of Marsh Warblers) for the area. 7 new Lifers in the first two days!